Frederik April 11, 2012 Comment? 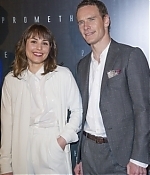 Today, Ridley Scott and his actors Charlize Theron, Noomi Rapace and Michael Fassbender have attended the Paris premiere for “Prometheus”. Pictures from the event have been added to the gallery with more to come.